Hosta have gone from relative obscurity in the late '70s, to the world's most popular herbaceous perennial for the last 10+ years, quite a feat! These perennials, mostly native to prairies (some in woods) of China, Japan, and Korea, have been grown in cultivation for well over 150 years. During that time, many varieties have come and gone. Today there are well over 5,000 cultivars, with more being added literally every week! Most figure that of these probably around 500 actually are distinct and garden-worthy. Among Hostaholics there is the so-called '10ft rule', which basically determines how distinct the variety is by stepping back 10 feet. There are many examples of varieties which are so close to another one that they can only be told apart by close examination. For example, 'Patriot' may have passed the 10ft rule upon its introduction, but you'll have a hard time telling it apart at that distance from 'Minuteman', which was introduced later. Hostas have become so popular that a lot of people have started to build a collection, the size of which obviously depends on the space available. We too have built up a very modest assortment and, like any good collector, are always looking for more to add. These days though we tend to be more picky about what we'll add and now have gone to the trouble of developing a wish list, the content of which tends to lean towards the smaller sized Hostas, since we do work in a small yard with limited space. The very first hosta we planted in our garden came from my youngest brother, Chris. It's a blueish one of an at the time undetermined variety, and with the input of some Hosta experts I think we finally have a handle on what it actually is: Hosta 'Fortunei Hyacinthina' is what the consensus seems to be. It's been a welcome addition and over the years we have had it, it has proven to be a solid performer. We have divided it several times and while it's only found in 2 areas in our gardens, in each respective location there is more than one clump and every year it makes a very nice looking part of the landscape design. My brother told me he originally obtained this variety years ago from a neighbour across the road from where he lived, who'd planted it when he built his house in the late 40's, back in the days hostas were still being referred to as Funkias and, more than likely as not, he figured it might well prove to be a species rather than a hybrid. There was far less hybridizing going on in those days and therefor it is less likely to be a hybrid, not an unreasonable supposition. No question we have seen an explosion of cultivars in the last 25 years in particular, and not just in hostas for that matter. A great deal of what we see these days in terms of new Hosta introductions are discovered in tissue culture as sports of other named varieties. On top of that there are plenty of hybridizers out there introducing new varieties every year, most of which end up in tissue culture, which leads to more sports and that completes the cycle again. It is amazing how some varieties have a very long list of descendent sports. 'Fortunei Hyacinthina' is the correct name for this plant, although it is frequently called simply 'Hyacinthina'. 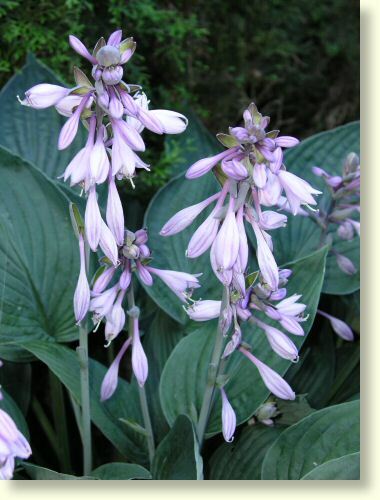 It is arguably the most important hosta in the commercial arena. Only a few cultivars can match it in the sales of both itself and its sports. 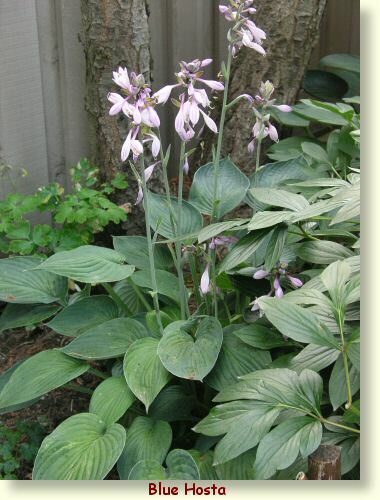 No other hosta, and probably no other plant of any kind can match it for the sheer number of sports it has produced. Over fifty have been named and many of those have been very popular plants. This is the simple all-green form that started it all. It originated in von Siebold's garden and was named in 1954 by Hylander (as a species) then changed to a cultivar by Schmid and registered in 1987. It varies somewhat in how glaucous it gets, but can be fairly blue although most are a deep slightly glaucous green, with an unusual dove-grey underside. The scapes are also glaucous and the flowers an attractive shade of lavender. Fertility varies with the sports, but the all-green form represented here sets seed reasonably well.